In light of its upcoming centenary in 2016, the time seems ripe to ask: why, how and in what ways has memory of Ireland’s 1916 Rising persisted over the decades? In pursuing answers to these questions, which are not only of historical concern, but of contemporary political and cultural importance, this book breaks new ground by offering a wide-ranging exploration of the making and remembrance of the story of 1916 in modern times. It draws together the interlocking dimensions of history-making, commemoration and heritage to reveal the Rising’s undeniable influence upon modern Ireland’s evolution, both instantaneous and long-term. 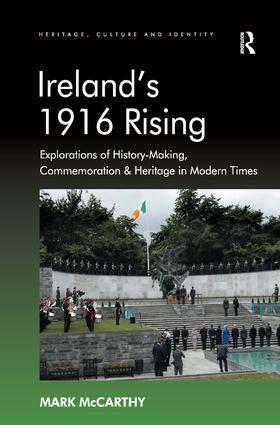 In addition to furnishing a history of the tumultuous events of Easter 1916, which rattled the British Empire’s foundations and enthused independence movements elsewhere, Ireland’s 1916 Rising mainly concentrates on illuminating the evolving relationship between the Irish past and present. In doing so, it unearths the far-reaching political impacts and deep-seated cultural legacies of the actions taken by the rebels, as evidenced by the most pivotal episodes in the Rising’s commemoration and the myriad varieties of heritage associated with its memory. This volume also presents a wider perspective on the ways in which conceptualisations of heritage, culture and identity in Westernised societies are shaped by continuities and changes in politics, society and economy. In a topical conclusion, the book examines the legacy of Queen Elizabeth II’s visit to the Garden of Remembrance in 2011, and looks to the Rising’s 100th anniversary by identifying the common ground that can be found in pluralist and reconciliatory approaches to remembrance.